For what type of patient can each of the products be used? The products manufactured by Diva Nutritional Products are suitable and indicated for a wide spectrum of patients and disease conditions. For more information on each product, go to the products list, click on the product name and go to “indications” to find out for whom the product is intended. What are the ingredients in each of the products? The ingredients are listed below the indications and packaging on the website. For a full specification contact the dietician at Diva Nutritional Products by following this link: tandimm@mweb.co.za. What form are the vitamins and minerals in? Are they bioavailable? We strive to only use the best forms of individual nutrients in our product, and buy vitamin mineral mixes from reputable international suppliers. The bioavailability of each nutrient differs. Vitamins used by Diva Nutritional Products are purchased in the form of premixes. These vitamins do get absorbed by the body as shown in our numerous clinical studies. Minerals used include both organic, encapsulated and chelated forms. The use of these were determined to ensure that the optimum absorption of the nutrients is obtained. RUTF stands for Ready to Use Therapeutic Food and it is a nutrient dense lipid paste, made from crushed peanuts, with added milk powder, glucose and fortified with appropriate micronutrients. RUTF’s have a low water activity, which virtually eliminates the risk for microbial contamination. In which circumstances should RUTF’s be used? RUTF provides all the nutrients required for recovery. RUTF’s were developed to supplement the diet of adults and children to address malnutrition. Pregnant women should restrict their intake to 1 sachet per day to prevent higher than required intake of micronutrients. Can infants below the age of 12 months use RUTF’s? Infants between the ages of 6 and 12 months may only use RUTF’s under close medical and dietetic supervision. The possibility of an allergic reaction to ingredients in the RUTF must be kept in mind when used in the treatment of young children. Can HIV-infected patients use it? HIV-infected or immune compromised patients will benefit from including RUTF’s in the diet on a daily basis. It is suggested that patients with clinical signs of lipodystrophy use the RUTF aggressively for a shorter period of time (about 6 weeks) for optimal weight gain, and then revert to other supplements with a lower fat content. How is Philani different from other enriched maize porridges? 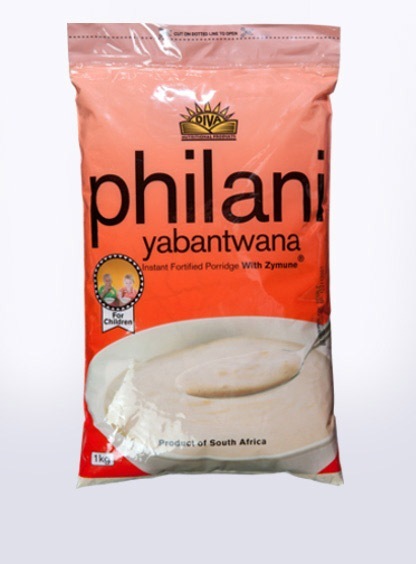 Philani contains Zymune (a mixture of amylase, phytates and anti-oxidants) which lower the viscosity of the porridge, making it easier to consume and digest. The glycemic index (GI) of Philani has been tested and is low due to the fact that it consist of carbohydrates, protein and fat and simulates a mixed meal. Philani can therefore be used by diabetics under supervision of a dietician. How should Philani be prepared? The porridge should be mixed with hot water to activate the enzymes. It can be consumed once cooled. If the patient prefers, it can be served as a drink. Nutri-Mil has no added milk, the product however does carry a milk allergen. This is purely due to cross contamination that occurs in the manufacturing facilities at suppliers, we can therefore not clearly state that the product is milk free. Is it suitable for use by people who are lactose intolerant? 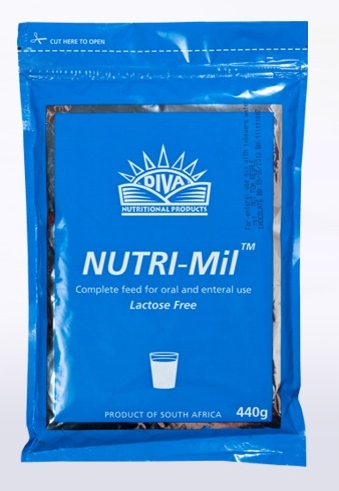 Nutri-Mil is safe for people with lactose intolerances. Lactose is a sugar that is found most notably in milk. Lactose makes up around 2~8% of milk, because Nutri-Mil does not contain milk the lactose free claim can be made on the product. How many liters does 1 packet make? One packet of Nutri-Mil makes +- 2.35 liters of ready to consume product. Diva is ISO 22000 compliant. The company is annually audited by SGS. Diva also works in accordance with Codex Alimentarius and local regulations and currently supplies RUTF to many AID agencies including UNICEF.